Undoubtedly, Tesla has stepped up the game for luxury SUVs. 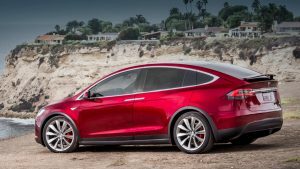 If you do remember, the automaker took their sweet time before releasing the Model X – for a good reason. They wanted a sturdy, luxury SUV that would embarrass sports cars in a speed contest. In a recent show of might, the Tesla team set up a challenge for their new ride. It was the ultimate test for endurance, design, and power. So how did it go? In the video, there’s a brand new Model X, a Boing 787-9, and a tense driver. If the plane’s size is anything to go by, the idea seems to be far-fetched considering that the bird a whopping 56 times heavier than the car’s towing limit. When the moment of truth arrives, the driver gets the go-ahead to give Porshe a run for their money. The car seems to struggle at the start, but it doesn’t take long before the plane’s tires start rolling. Surprisingly, it towed the plane 987 feet on a runway. In the end, the exercise was a success, and the car received an extraordinary status. It can hold together under pressure and also has the capability to tow pretty heavy stuff. So, the possibilities are truly endless. But what makes the Model X tick? First, the exterior design is pretty impressive; it displays the perfect mix of mean and modern. The engine has an impressive 603 horsepower and 713 pound-feet of torque. Ideally, that’s the power of a truck in an SUV. It can carry seven large adults in luxury, and the safety features on it are way above those of other SUVs in its class. With a speed of 210 km/h, those long road trips will never be the same again. Does that sound like a dream car or what?